The Nexus 5001™ Forum, formerly known as the Global Embedded Processor Debug Interface Standard Consortium, was formed in April 1998 to define and develop a much-needed embedded processor debug interface standard for embedded control applications. IEEE-ISTO 5001™-1999, The Nexus 5001™ Forum Standard for a Global Embedded Processor Debug Interface, is an open industry standard that provides a general-purpose interface for the software development and debug of embedded processors. As advances in semiconductor and system design continue, embedded applications are using higher-performance embedded processors. Efficient use of these embedded processors requires software and hardware development tools that can easily access critical processor functionality. Standardization on this interface benefits customers' reuse of their Nexus 5001™ compliant development tools on compliant processor architectures. 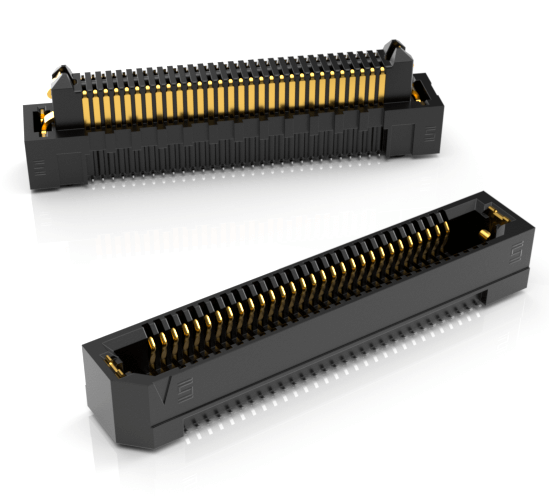 The Nexus 5001™ standard recommends Samtec’s Edge Rate® ERM8/ERF8 Series connector sets featuring our unique Edge Rate® contact system. The Nexus 5001™ ERM8/ERF8 Series system provides seven sizes: 10, 11, 17, 23, 25, 35 and 40 positions. These four sizes provide a family of solutions for those more concerned with real estate to those who seek the maximum number of signals. Board-to-Board solutions will have the friction latches. Cable-to-Board solutions will use the squeeze latch for higher mating retention force. Both the Board-to-Board and Cable-to-Board solutions will be intermateable with the same female socket. Samtec makes no warranty or guarantee as to the suitability of its products or models for any specific application. Samtec reserves the right to make changes at any time without further notice. Models were developed using nominal values for physical dimensions and material properties and specific grounding and boundary conditions. Actual in-circuit performance can vary significantly from simulated results. All parameters should be validated by the customer’s own technical experts. By downloading a model, the user agrees to absolve Samtec from all liability related to the use or application of the model or product. The models herein are for the limited purpose of considering the purchase/use of product(s) of Samtec, Inc. ("Samtec") and contain proprietary information of Samtec, our various licensors, or both. Samtec does not grant express or implied rights or license under any patent, copyright, trademark or other proprietary rights and the use of the models for building, reverse engineering or replication is strictly prohibited. By using these models, the user agrees to not infringe, directly or indirectly, upon any intellectual property rights of Samtec and acknowledges that Samtec, our various licensors, or both own all intellectual property therein. The models are presented "AS IS". While Samtec makes every effort to present excellent information, it does not warrant the models are without error or defect or the use of the models in terms of accuracy, reliability or otherwise. The user agrees that all access and use of the models is at its own risk. NO WARRANTIES EXPRESSED OR IMPLIED, INCLUDING ANY WARRANTY OF MERCHANTABILITY, FITNESS FOR A PARTICULAR PURPOSE OR OF ANY KIND WHATSOEVER ARE PROVIDED.